Just wanna test about Oracle Multitenant Self-Service Provisioning again. In this post, I wanted to test closing/reopening PDB. Previous post, I tested cloning PDB and some PDB (TESTPDB01) status = "READ ONLY. 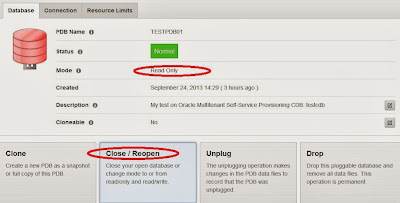 It shows... Users can reopen as "READ WRITE" or "Close PDB"... Tested with "Close PDB". PDB status = "Mounted", then tested "Open" as "Read Write". PDB status = "Read Write". 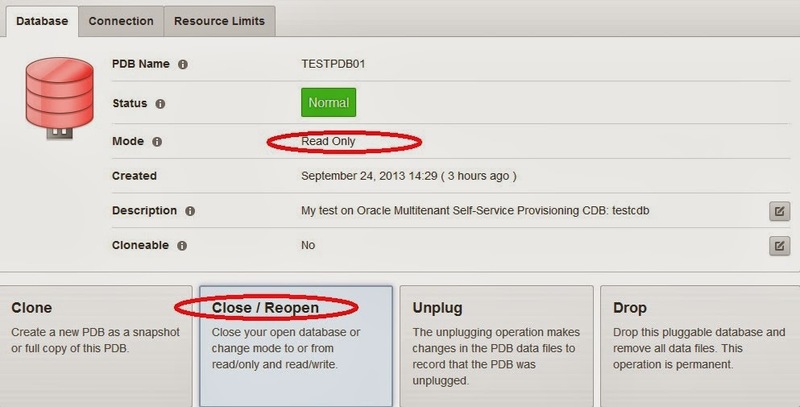 So, that means it's all right for Close/Open PDB on Oracle Multitenant Self-Service Provisioning.